I ate escargot for the first time a few months ago. That I didn’t enjoy it probably had to do with the fact that Aderman, my videographer, ruined the experience by telling me that snails “are like snot in a shell”. I spared myself one of his too-detailed explanations by NOT asking how he came to this revelation. So whilst I don’t have a penchant for escargot, there are some birds who, like French people, do. In particular, I’m referring to Snail Kites and Limpkins, true snail specialists that have a very limited distribution in the United States. I live in Florida so when I was approached by Palm Beach County to film a TV episode featuring the birds of this part of the state, I chomped at the bit. This would be a unique opportunity to feature the birds of my backyard. I literally have Snail Kites living 20 minutes away and Limpkins even closer. Limpkins and Snail Kites feed almost exclusively on Florida Apple Snails. Apple Snails are unique amongst the snails in that they have both a lung and gills, allowing them to lead an amphibious lifestyle. This is an unusual adaptation that enables them to hide underwater from aerial predators like Snail Kites but also allows them to lay their eggs out of the water, away from predatory fish and other aquatic animals. Florida Apple Snails get quite large and, once the meat is removed from the shell, provide a sizeable meal for both Limpkins and Snail Kites. But their availability is also heavily dictated by water levels. Dry downs are events that occur naturally in Florida wetlands as a result of the water table dropping below ground level. But the frequency of dry downs has increased due to intensive water control projects. This increase in frequency negatively affects Florida Apple Snails which in turn negatively affects Limpkins and Snail Kites. John Prince Park in Palm Beach County Florida is a place where Limpkins run around like chickens. So I picked up Aderman one morning and we headed over to film them. As per usual there were many different Limpkins to choose from and we set about filming a bird that was actively hunting for its hungry youngsters. Anyone who watches the behavior of Limpkins quickly realizes that these are bizarre birds. The common name comes from their peculiar “limping” gait but it is their taxonomy, more than their behavior, that is truly bizarre. Nobody is really certain exactly where this bird fits into the mix. They superficially resemble ibis and behave in some ways like rails. But skeletally they share more affinity with cranes. For this reason they are placed in their own monotypic family Aramidae within the order Gruiformes that includes both rails and cranes. Various authors have suggested they are related to spoonbills, ibis and even finfoots. For now they remain where they are – amongst the Gruiformes. Until someone decides to place them within their own monotypic order, Bansheeiformes, on account of their bloodcurdling calls. Having Snail Kites so close to home is pretty neat. In order to film them we headed off to Arthur Marshall Loxahatchee National Wildlife Preserve, situated just along the edge of the Everglades. 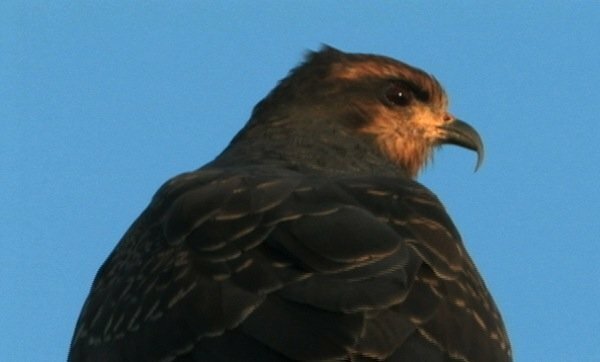 Although Snail Kites have a widespread distribution in Central and South America, there are only around 400 pairs of Snail kites in the United States, all of them in Florida. And this number fluctuates widely according to the availability of the snails. Whilst food specialization means you become the best in the game (in this case catching and eating snails), it does have its disadvantages. What happens when that food source becomes scarce? Besides starving, you have the choice to either migrate to greener pastures or to steal from the more fortunate. And Snail Kites are not above resorting to kleptoparasitism during times of drought. Snail Kites have a much harder time getting to submerged or buried Apple Snails and they sometimes let Limpkins do the dirty work for them, swooping in last-minute and stealing the rewards. A great resource for visiting the excellent birding sites around Palm Beach County and the whole of Florida is the Great Florida Birding Trail. So pick up a GFBT map and come down and meet these unique birds for yourselves. …“are like snot in a shell”. James, he was right. He didn’t ruin your experience, he gave you fair warning. As always, stunning videos of great birds, embedded in very fine words. Of course, Florida has been on my must-visit list since I saw the movie “Swamp Thing” as a boy (what? Louisiana? Who cares? ), quite some time before I became covered in mysterious chemicals myself, caught fire, and ran screaming into a swamp, to return as a monstrously mutated person known as a “birder”. You failed to mention that there are two types of Apple Snails her in Florida, one native and the other exotic. The native one is small and it is an example of convergent evolution with Snail Kites & Limpkins. The other one is an exotic from Cuba and is large. This is the Apple Snail one is likely to encounter since it is pushing out the native snails. Limpkins have no problem getting at the snail inside this larger shell. However, Snaol Kites, especially young Snail Kites, do. Their powerful bills are shaped to extract food from the native Apple Snail shells. Thus, there is more to the story then what you have told. . . . Excellent! A good year for Limpkins. Never seen as many as this season. And of course great shots of the Snail Kites! Good job! @Vincent Lucas: You are right Vincent. I suspect there may be more than just one species of exotic Apple Snail in Florida. Exotic Apple Snails are commonly kept in aquariums and released (like so many exotic fish) into the waters of Florida. This is an important aspect to the story so thanks for bringing this up. @Klaus: Yes, there do seem to be so many Limpkins around. I wonder if it has to do with the expansion of the exotic apple snails as mentioned above? German birders, of course, don’t know anything about cooking snails…. It is all about the “beurre d’escargot” (mix of garlic, parsley and butter), James…..I suggest you give another chance! Brilliant piece as ever, James. And now I suspect that Aderman and I may agree on more than we disagree! @Vincent Lucas, thanks for pointing that out. We found a number of Apple Snail shells at Three Lakes WMA and I was surprised at how large they were. You’ve cleared up my mystery. @Laurent: Thanks. I’ll have to give it another try. Perhaps combined with a healthy portion of frog’s legs? No way. The taste of the Escargots is pretty strong, and would totally kill the delicate flavor of the frog’s legs…..sometimes, too much of a good thing is a bad thing! On a very tangential note I can’t help but add “My car go, one-sixty, swiftly” every single time I hear “escargot.” R.I.P. Biggie! Oh, and I loved the young Limpkins!